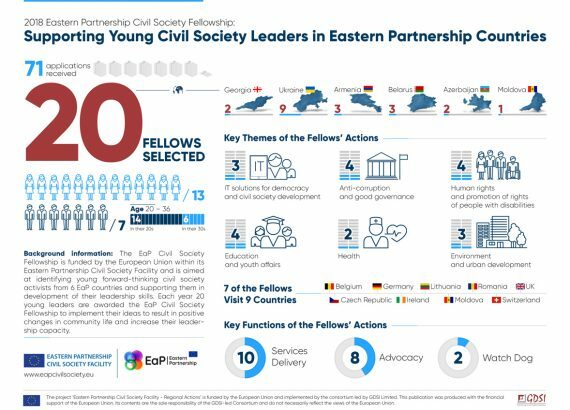 Another batch of fellowships under the Eastern Partnership Civil Society Fellowship Programme has been granted to young civil society activists from Armenia, Azerbaijan, Belarus, Georgia, Moldova and Ukraine to strengthen their contributions to civil society development in their respective countries. This fellowship initiative within the EU-funded Eastern Partnership Civil Society Facility is built around annual calls for applications with new ideas of positive changes in community life and leadership skills development from qualified civil society activists in EaP partner countries. Each call concludes with the selection of 20 best applications whose authors receive fellowships to bring their initial concepts to fruition. The call of this year was the second one in a series of four lined up within the Fellowship Programme; by the end of 2020, a total of 80 applicants will gain the Fellow status to perform activities aimed at addressing problems in the lives of their communities, regions and countries. The 2018 EaP Civil Society Fellowship call resulted in 71 applications submitted to the attention of the Evaluation Committee; from that number, 20 new fellows, of them 13 women and 7 men aged between 20 and 36 from all the EaP countries, have been selected based on their track-record of achievements to date and the strong potential they demonstrated in their proposals to act as champions of change in the civic sphere. Ozheni AVETISYAN Development of leadership skills of young women in rural areas of Armenia. Diana SARUMOVA Advocacy of gender-free approach and equal treatment among SMEs and entrepreneurs of Armenia. Mariam ZADOYAN Setting up the institute of beneficial ownership to facilitate the fight against corruption in Armenia. Kenan ASLANLI Monitoring and evaluation of the national policy implementation on open government and economic development of Azerbaijan. Lamiya RZAYEVA Building skills of local media in covering social topics. Volha VIALICHKA Improving the provision of palliative care for children in the Grodno region. Lizaveta CHEPIKAVA Mobilisation of Minsk residents to support people-centric urban development projects. Yauheni KLISHEVICH Development of online interactive manuals for CSOs on crowdfunding and crowdsourcing. George CHANTURIA Advocacy on school management reforms in Georgia through policy research. Gogita GVEDASHVILI Raising awareness on EU visa free rules and opportunities for Georgia. Corneliu DONI Support to resocialization of justice-involved youth. Tamila BABAK Promotion of social inclusion of visually impaired people through sports projects. Mykola HRAMAZHORA Increasing knowledge and skills on energy efficiency among youth. Anna IEMELIANOVA Promotion of e-participation of citizens in policy making through e-petitions in Ukraine. Antin KUSHNIR Improvement of accountability of the professional associations of paediatricians of Ukraine. Karyna LITVINOVA Facilitating citizens’ access to e-Services in amalgamated communities (hromadas). Marianna MARSHALENKO Promotion of bike-friendly attitude among HoReCa companies. Olena MEDVEDENKO Advocacy actions for better implementation of public consultations in Ukraine. Valeriia OVCHAROVA Support to improvement of social work with local youth in the South-Eastern Ukraine. Kateryna PUKHA Increasing the leadership potential of adolescents studying at vocational schools. 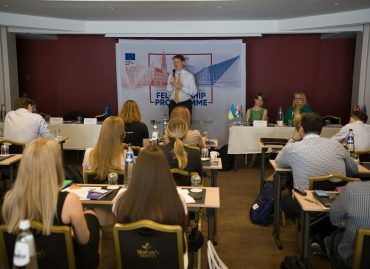 The European Union’s unwavering commitment to support civil society development in the Eastern Partnership countries has been focused on developing leadership capacities and skills of future civil society leaders as one of the highlights of its policy of ’20 Deliverables for 2020. Focusing on key priorities and tangible results’. 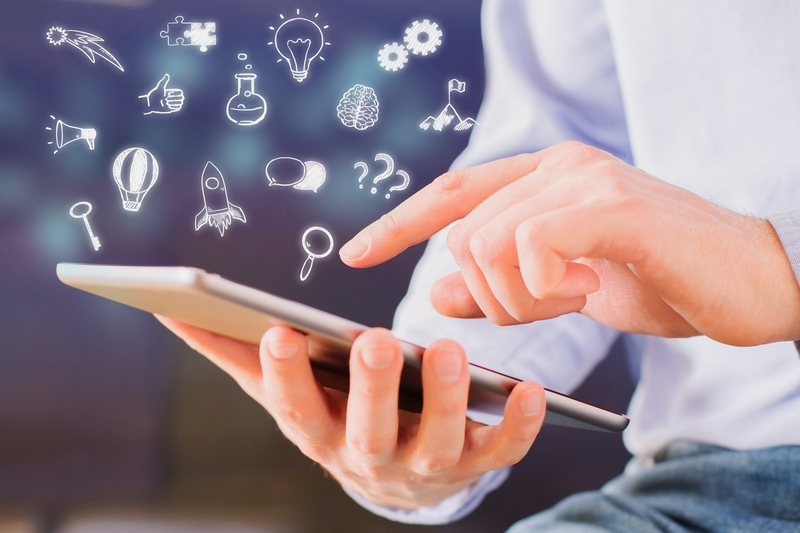 The EU strongly believes in investments in leadership potential as a measure to drastically improve professionalisation of civil society organisations and their capacity of engaging in constructive policy and societal dialogue in Eastern Partnership countries. This support is an investment in the development of young current civic activists and civically minded individuals from the EaP region, who display the interest and ability of taking leading roles in the growth of their societies. The Eastern Partnership Civil Society Fellowships are an integral part of the Eastern Partnership Civil Society Facility – Regional Actions project funded by the European Union and implemented by the consortium led by GDSI Limited to strengthen and promote civil society’s role in reforms and democratic changes that are taking place in the Eastern Partnership countries. 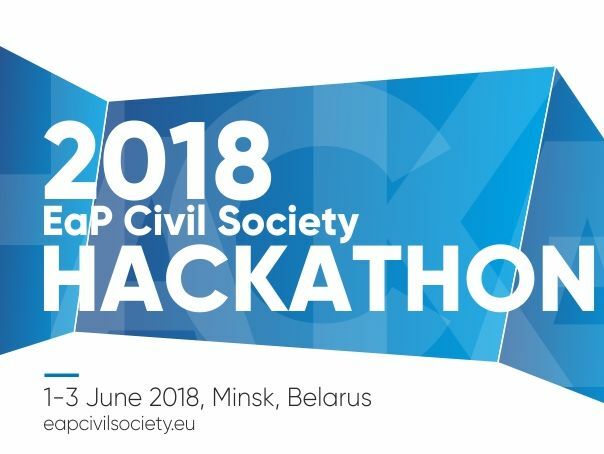 Visit www.eapcivilsociety.eu hub for more details.